The Fellowship was fortunate enough to obtain a copy of SNARKED #6 from Kaboom Studios. 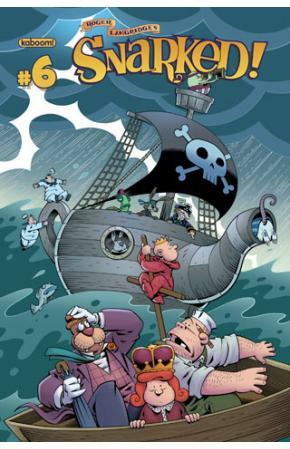 Roger Langridge writes and draws, and Lisa Moore colors. This book is based very loosely on characters created by Lewis Carroll. Queen Scarlett is on a quest to restore her father’s throne, with her faithful servants the Walrus and the Carpenter in tow. In this issue their voyage (and their dinner) is interrupted by a pirate attack, and the consequences are dire indeed. This is most assuredly a fantasy adventure story with a sizable vein of humor running through it. You’ve got your coming of age quest, your sturdy knights, and your very lofty goal. And you’ve also got your very modern, very anachronistic, rather silly sense of humor deeply embedded in your story. The fun thing is that I’m a big fan of both, and Mr. Langridge pulls it off brilliantly. (No surprise there; he’s an award-winning writer.) I also like that he makes obvious that this is a side trek (if you’ll pardon the fantasy gamer speak); there are other, larger things in the works for this story arc. SNARKED #6 is available now at your FLCS or by order from kaboom-studios.com.